Gardening tips for the elderly and people with physical disabilities. My advice before spending a lot of money is to consider some of the cheaper ways to make your garden more accessible. To make this page as short and readable as possible I have included links to other pages on my site providing a bit more detail. The links do not lead to adds and are safe to use. Tips on this page include: Digging, Growing and Sowing, low maintenance plants, help with gardening, weeding, watering, steep slopes, garden layout and design for physically handicapped and elderly gardeners, my top tip for gardeners with limited mobility and tips for wheelchair gardeners. Raised beds can be made from anything that will hold soil, even old car tyres. Most gardening tools can be easily adapted making buying new ones unnecessary. Digging helps break up the soil, aerates it, and helps to loosen weeds. Regular hoeing, light forking and adding well rotted compost from your compost heap make the old fashioned back breaking annual dig almost redundant. 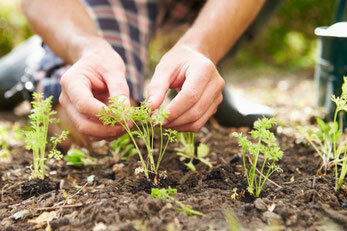 Read this article if your age or disability make digging difficult gardening without digging. Digging and weeding is easier if you keep your beds narrow or accessible from both sides. Using adapted gardening tools, like long handled trowels and forks help, some tools are easy to adapt yourself, tips here tools for disabled gardeners. If you have retaining walls, cultivate the area that runs along behind the wall, laying a weed suppressing membrane and planting through slits cut in the material can help keep weeds at bay. If your soil is mostly clay, try this breaking up clay. Save money and grow plants from seed. You will also have spare plants to share or sell at your local car boot. I get a lot of satisfaction growing from seed, sometimes it doesn't work out, but even at my age it's still one big learning curve. You can grow seeds direct into the garden or in the greenhouse. It's easier on your body if you can sow direct into the garden beds where the plants will grow, especially if your beds are designed as narrow reachable borders or raised beds. Mixing fine seed with sand makes it easier to sow if your hands are a bit stiff. When and what to sow tips can be found on other pages of my website. The cheapest and least physical way to grow fruit, vegetables and flowers is to grow from seed, sown in the place you want them to grow, you will need to thin the seedlings out following germination and keep them watered, but that's about it. This page sowing seeds will explain how. If your travel and shopping isn't restricted, transferring seedlings from trays into your garden or containers is fairly easy and I have included a few planting tips next. If your mobility problems don't restrict you traveling and shopping, buying seedlings in pots or trays is a fairly easy way to buy the plants you would like to grow in your garden. They are easy to plant, simply soak the container, tip or gently push out the plant keeping some of the compost around the root, form a hole in the ground big enough to take the root and compost, place the plant in the hole, cover with soil and firm down. Keep the seedlings watered and watch them grow, some easy to follow tips here.Growing your own tips. The upside to planting low maintenance plants, Is they do make garden maintenance easier, the downside is it restricts choice and maybe all year round colour. If you can plan your borders to be reachable from all sides and avoid quick growing shrubs you should be able to plant for all year round colour. If you are not the over fussy type, bulbs, many cottage garden plants and herbaceous plants can be left to die back themselves, looking attractive even in winter with frosty heads and cobwebs and eventually disappearing back into the soil, before re-appearing again in spring. The same rules apply, work within your capabilities, keep borders or planted areas to a reachable width, especially if working from a wheelchair, plant dwarf beans if standing up for long periods is difficult or painful, and if bending is the problem use raised beds. Ground cover shrubs will help keep weeds down and add interest. Low growing fruit trees give colour and the benefit of the Autumn harvest. list of ground cover plants. Watering the garden and containers. During long dry spells watering your garden is time consuming, but if you have a disability or bad back that makes bending difficult, watering can be made easier. A light plastic, flat-sided watering can is easier to use than a round one, also water butts and stand pipes at convenient places around the garden makes the job of watering plants a lot easier. If you haven't got stand pipes in convenient places, leave the hose pipe rolled out ready during long hot spells. .......Grouping containers together and placing saucers under them, as well as mulching the soil and watering in the evening, when there is less evaporation all saves water and time. If because of a disability or age, gardening, planting, weeding and watering is becoming a problem, but you enjoy being in your garden and doing it, keep it simple. Light and often is better for your general well-being, and for your garden. Garden on a steep slope. If you are disabled and have a sloping garden, it is likely the slope is making planting, garden maintenance or mowing your lawn difficult, especially when the surface is wet. So think leveling, terracing or maybe installing a winding pathway through the slope. More about sloping gardens here. Hiring a hard landscaper to level or terrace a slope is fairly expensive, so another option might be to use the area at the lowest point, nearest the house and loan out the steep bit in return for a few fruits and vegetables. If loaning out your garden is an option take a few necessary precautions. Don't allow access through your home. Only provide a key for a side entrance gate. If possible choose a person you know well. Check the person has similar ideas to yours for the garden. Don't allow sheds etc. to be erected. Tell the neighbourhood watch, family and friends about your plans. On the plus side allotments are in short supply so someone is going to be very grateful and a big plus for you will be a tidy and productive garden slope. Another big plus you might find they are chatty. If you live in the Wandsworth area of London. Garden Partners is a garden-share scheme that matches people over the age of 60 who would like help managing their gardens, with volunteers who tend the garden regularly in return for their own growing space. The partners form a team to plan how the garden will develop and share in any fruit or vegetables. Google "garden partners" + (your town) to find a local scheme. If leveling is an option Visit the sloping garden page for more information on building retaining walls, etc. Getting rid of annual and perennial weeds keep your garden beds tidy and your plants healthy. Weeds take up the moisture and nutrients your plants need too thrive. An overgrown weedy garden is a daunting sight and you may be tempted to stay in front of the television, so don't try to clear the lot in one go, little and often does it, especially if you have a bad back or disability that makes bending difficult. Once you get on top of it either by hand weeding or using weed killer, it is easier to keep your garden weed free. Narrow, and raised beds are easier to keep weed free, more about that later. You can also purchase specially adapted tools to make weeding a bit easier. This Wheeled gardening seat is a great gardening aid if you suffer from a bad back that makes bending difficult it reduces the stooping and bending associated with weeding and planting etc. The swivel tractor-type seat lets you sit and work up to 23" above the ground and roll around on four large 10" diameter pneumatic tires.The tray under the seat is handy to carry your gardeners tools along with you.. Most of the gardening tips on this page, together with the use of some specially adapted tools, will help if you are gardening from a wheelchair. The most important design factor will be easy access to your garden and to be able to get around the garden with ease. Access and getting around a Garden. Hard landscaping with smooth paving, turning places, raised edgings especially on corners act as brakes if yours fail, handrails and gentle gradual sloping ramps in place of steps are essential for getting around in a wheelchair. Pathway lighting and spotlights around the raised beds and borders will help keep on gardening as the nights draw in. Well thought out Lighting can also add interest to a garden and if you are going down the wildlife friendly route, good lighting makes spotting the wildlife visitors to your garden easier at night. Garden design for wheelchair gardeners. Good well thought out garden design and hard landscaping, including pathways, Roll out paths can be a good and cheap alternative to having concrete or slab pathways built). and ramps for wheelchair access, will make gardening easier and I have covered recommended width measurements, gradients and layout on the disabled garden layout page . Raised beds, reachable borders, hanging baskets and accessible arbors and trellises all make gardening easier without having to stretch or bend to reach your plants. Some hanging baskets even come with their own pulley system so they can be raised and lowered from your wheelchair. There is a whole range of specially adapted gardening tools available which are custom made for wheelchair users and the elderly who may find bending and stretching difficult. Some come with attachable extension poles and others have specially modified grab and hold mechanisms. You can even get gardening gloves that have sticky palms. I have included long reach and easy to grip tools and tips on modifying and adapting existing tools on the tools for disabled folk page. A garden designed or adapted for wheelchair access and mobility can look good and a be a blessing. How wide does a pathway need to be for a wheelchair or zimmer frame user. What materials are best for hard surfaces for wheel-chairs? What height is best for handrails for people with balance problems or limited mobility? Some tools and aids can be adapted or modified yourself. Making and adapting your own gardening tools, to help with your own special physical needs, really can make many difficult or uncomfortable gardening jobs easier and I have a few tips on this page of my website. Adopted gardening tools. If you prefer to buy tools try your local ironmonger or buy online. Large Garden centers charge a lot more. Boundary fencing or hedging ? Hedges are often fast growing and need a lot of pruning. You might be better fitting panel fencing. Single panels that get damaged are easier to replace if you use slotted posts. Try growing vine type vegetables like Runner beans or fragrant vines like clematis, climbing rose, honeysuckle, and jasmine to cover the fence. Tips we have discussed can be applied to greenhouse gardening. Make sure benches are sturdy, the door is wide enough and the base isn't trippy. Plastic is safer than glass. Most of the basic stuff is included on my greenhouse gardening page. If you haven't got a greenhouse and have someone to help dismantle and collect a secondhand greenhouse, have a look at the used greenhouses listed for free. You can post a request for a used greenhouse in your area for free. My 8 top gardening tips for gardeners with limited mobility. Raised garden beds make the garden more accessible for planting and harvesting.If you can't bend easily, raised beds and container growing makes digging and weeding easier. Containers and raised beds look attractive and are ideal if you can't bend. Raising a garden bed just a few inches makes planting, digging and weeding so much easier if you are disabled or using a wheelchair. Almost anything can be used to make a raised bed as long as it raises the working surface to a level that will make gardening easier. More information on my raised garden beds page. Use lightweight tools that are easier to handle. And gardening tools that have been specially adapted for elderly or disabled folk like the ones I have selected here. Or you can adapt your own gardening tools to make them more comfortable to use with foam, tape and plastic tubing etc. Have plenty of easily accessible shade areas for working in during hot weather in the summer and make sure to shelter to escape the rain in winter. Have stable chairs spread around your garden and easily accessible tables to take frequent breaks and have a drink. Drink plenty of water or juice, especially on hot days.Having plenty of seats in shady areas where you can sit and ponder and get your breath back whilst digging and weeding. Ensure that there are taps near container planted plants and seed beds or maybe install a drip feeder system for easy watering.It's a good idea to have quick and easy access to a toilet. Large lawns with many curves take a lot of maintenance. Not for me, but artificial grass needs almost zero caring for. Dividing up the area into workable flower or vegetable beds is a better solution, as is paving, or even letting the lawn go wild and laying paved paths through it if you use a wheelchair, a walking stick or walking aid.Walking through a wild lawn is one of life's treats. Much more interesting than those chemically green lawns you can see over the fence! The grand children love exploring and rolling around in it as well. More on the wildflower lawn page. Borders are much easier to maintain if you can reach across them easily. So build your flower borders to be a maximum two foot wide and maybe have flagstones placed in the flower border to kneel down on. Ponds are a peaceful feature, but can be high maintenance unless you choose a wildlife pond, planted up with slow growing native British pond plants. If you have a pond avoid pond plants that grow fast or Koi and maintenance will be minimal. If you are use a wheelchair or not too confident on your feet, erect a sturdy rustic fence and handrail around your pond. There's a bit more information about looking after ponds and choosing pond plants on my pond page.